Our associate reports that there have been massive protests against the entry of Reliance Fresh in the lawless and highly corrupt states of Uttar Pradesh and Orissa. Reliance Retail, a subsidiary of Reliance Industries, is laying off 1,000 staff in Uttar Pradesh after failed attempts to reopen modern supermarkets, which closed after protests from small traders. The move by Uttar Pradesh state to shut 10 Reliance Fresh supermarkets was amid fears that millions of small shopkeepers and traders could lose their jobs. 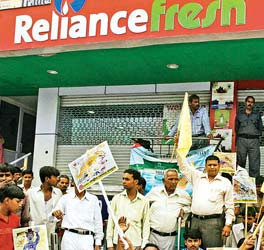 In another setback for Reliance, around 15 stores in Noida and Ghaziabad, both in New Delhi, were shut over the last week on police orders, although staff there has not yet been sacked.This week, traders in eastern Orissa state ransacked two Reliance Fresh stores, forcing police to order their closure, one of several incidents in the last month across India.